The total system consists of the wind turbine and load. 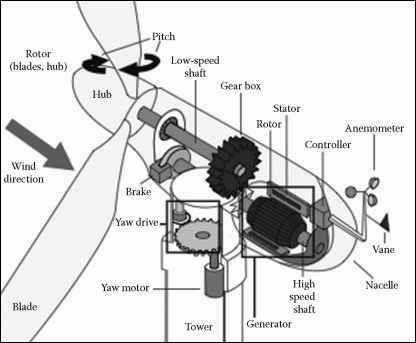 A typical wind turbine consists of the rotor (blades and hub), speed increaser (gearbox), conversion system, controls, and tower (Figure 5.9). The nacelle is the covering or enclosure. 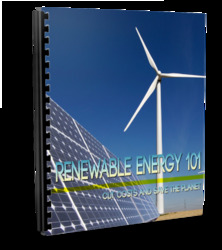 The output of the rotor, rotational kinetic energy, can be converted to electrical, mechanical, or thermal energy. Generally, it is electrical energy, so the conversion system is a generator. Blade configuration may include a nonuniform platform (blade width and length), twist along the blade, and variable (blades can be rotated) or fixed pitch. The pitch is the angle of the chord at the tip of the blade to the plane of rotation. The chord is the line from the nose to the tail of the airfoil. Components for a large unit mounted on a bedplate are shown in Figure 5.10. Most large wind turbines, which are pitch regulated, have full-span (blade) control, and in this case, electric motors are used to rotate, change the pitch of the blades. All blades must have the same pitch for all operational conditions. For units connected to the utility grid, 50 or 60 Hz, the generators can be synchronous or induction connected directly to the grid, or a variable-frequency alternator or direct current generator connected indirectly to the grid through an inverter. Most direct current (DC) generators and permanent magnet alternators on small wind turbines do not have a speed increaser. One type of large wind turbine has no gearbox, which means it has very large generators. Some HAWTs use slip rings to transfer power and control signals from the top of the tower to ground level, while others have wire cords that have extra length for absorbing twist. After so much twist, it must be removed by yawing the turbine or by a manual disconnect. For large wind turbines, the transformer or a winch may be located in the nacelle. 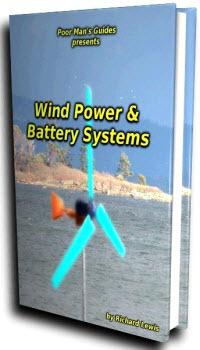 A total system is called a wind energy conversion system (WECS). FIGuRE 5.9 Schematic of major components for large wind turbine. FIGURE 5.10 Photos of components, Suzlon, 64 m diameter, 1,000 kW, induction generator 4/6 pole. 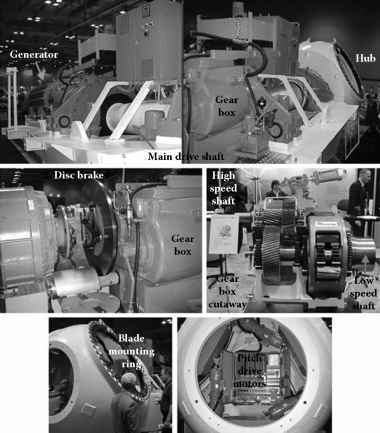 Bottom right: Cutaway of gearbox, Winergy.